Four Seasons is known for being the best in hospitality, guest experience, and their food and beverage program. 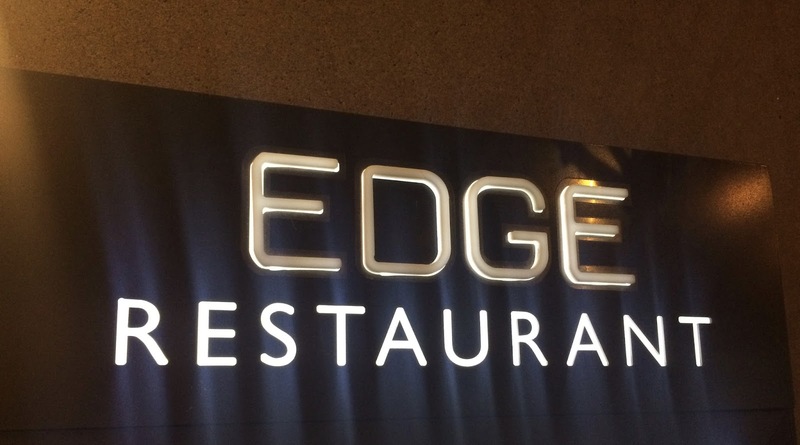 EDGE Restaurant stayed true to that statement! This was an exceptional dinner that left us with room for only one dessert. EDGE Restaurant is a steakhouse through and through that uses local Colorado produce and proteins. In fact I had elk for the first time and it was amazing! The dining room was beautiful and contained many art pieces, including sculptures near the entrance. The atmosphere was a little romantic with its wooden and amber colored tones with dim lighting that projected the art pieces in a spotlight setting. It was almost like we were dining in an art museum. The pastry chef of EDGE is Ryan Schmitt and he is also the executive pastry chef of the entire hotel overseeing production for the restaurant, banquets, in room dining, cakes and special amenities. He has already achieved so much in his career and it is only just the beginning for him. Already an executive pastry chef for a Four Seasons property is an esteemed position and achievement itself but back in 2014, at the age of 27, he was featured in Zagat’s 30 under 30 Rockstars Redefining the Industry. Chef Ryan is young and creative who will continue to impress guests as he continues his successful career. At times dessert menus can feel out of place, but Chef Ryan does a great job creating a menu that is a continuation of dinner. The menu reflects the restaurant and its image very well offering classic desserts with a modern twist such as a triple chocolate cake with an orange marmalade, a frozen snicker bar or a pineapple cake which is what we indulged in. This dessert is somewhat a play on an upside down pineapple cake. It is rich with strong caramelization flavors, a little nutty from the brown butter hazelnut cake and slightly tart and refreshing from a cherry mousse. 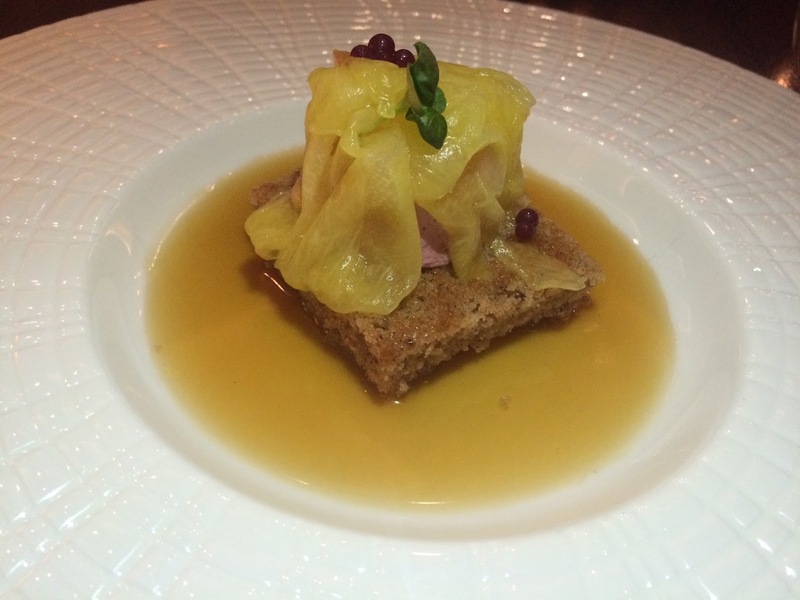 The pineapple cake consists of fresh, roasted pineapple slices placed on top of a light cherry mousse dome and a rich, nutty brown butter hazelnut cake that sits in a basil honey syrup. The presentation is beautifully plated in a large white shallow bowl with everything staying simple and letting the bright colors of the yellow pineapple and amber basil honey shine. The basil honey syrup was delicious, nice consistency and colorful. The basil flavor was very mild with the honey coming out as the more dominant flavor. The brown butter hazelnut cake is the richest component of the dessert. The richness and sweetness comes from the brown butter and could taste the nuttiness of the brown butter in addition to the hazelnuts. It had great texture and was kept soft soaking in the basil honey syrup. The sliced pineapple was captivating with how much flavor it had. It was sweet but never overwhelming – my only guess is that it was roasted in the basil honey. The cherry mousse was very light and refreshing, slightly tart and balanced out the sweetness of the other strong components nicely – it truly completed this dessert. This was a delightful dessert to finish our excellent dinner because after being full from our foie gras, elk tenderloin and miso glazed cod we knew chocolate would be too intense. 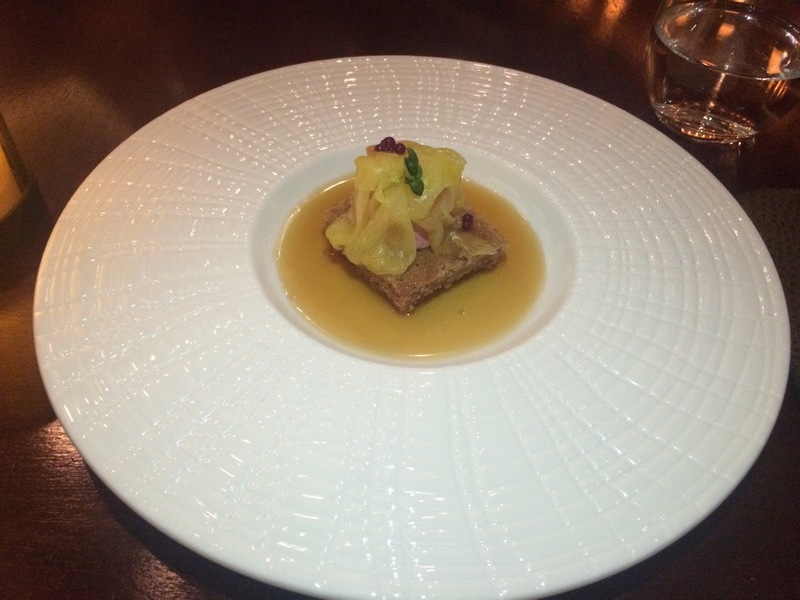 The pineapple cake was sweet, warm and refreshing – like a breath of fresh air, it was something different.